Eugene Hallette founded La maison Hallette in 1887 in Caudry, where it quickly became the third-largest of the 170 lace-makers, with 6 Leavers looms. The company grew steadily until 1898, when Eugene Hallette died of a sudden illness. His wife then ran the company single-handed, renaming it Etablissements Veuve Eugene Hallette (“Widow Eugene Hallette`s Company”). Trained in tulle manufacturing by his father, Etienne Lescroart took over Hallette at the age of 23. Etienne was an entrepreneur and keen businessman, and by 1952 had grown the company to approximately 50 employees. In 1967 he opened a Paris office which he named Dentelle Sophie after his niece. His son Bruno later joined the company and grew the export business considerably; as true lace-maker, concentrated efforts on design and creation. By the dawn of the millennium, Sophie Hallette employed nearly 400 people. The third generation of the family took over in 2000, leading Sophie Hallette into the challenge it now faces: to combine it’s rich tradition and expertise with high-performing, modern methods. 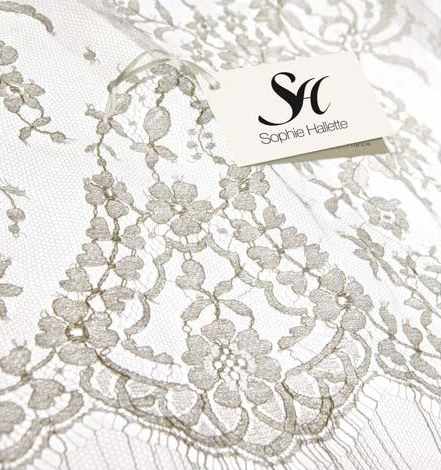 Sophie Hallette lace weaves intimate links between past and future; between tradition and innovation. It speaks of timelessness. Sophie Hallette`s lace bears all the hallmarks of truly artistic craftsmanship, and recounts an entire history — but is above all unique. More about Sophie Hallette in our blog!